Spring has come and it is time for all of you lucky ones that have convertibles to take your beauties out for a drive. Even if you don’t have convertible you can sit in your car and just drive. Just drive without any plan, without any destination. What ever car you have, there is on a thing that adds that special touch to driving. I am talking about leather driving gloves. My first recollection of driving gloves takes me back to my childhood. I can’t remember how old was I but I remember it like it was yesterday. First time I saw leather driving gloves was in TV commercial. It was commercial for some cheap cologne water, but the cologne is not important at all. Story was that some really cool guy (epitome of grooming products model) was driving old Jaguar E Type convertible. He was grasping the steering wheel of this beautiful car with his black leather, full of air holes, driving gloves. It was the first time I saw this kind of gloves. The rest of the commercial is not important cause only thing that embedded in my mind were the gloves and they stayed there till the time I was old enough to buy this kind of gloves. When I say old enough I don’t mean old enough to have money to buy them I mean old enough to deserve them. Old enough to appreciate and truly enjoy them. 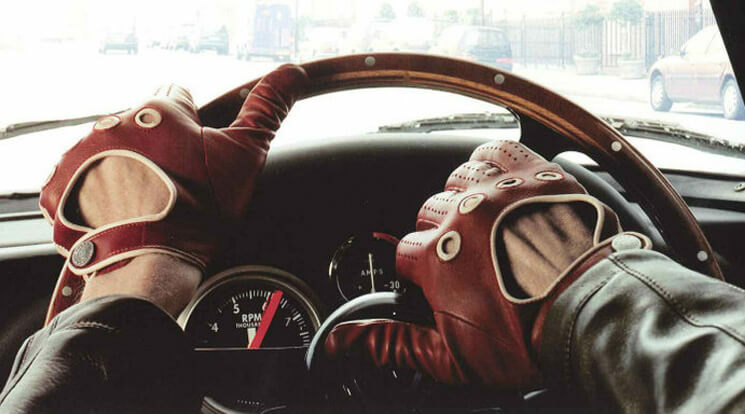 Driving gloves go way back to the beginning of the 20th century. Their original use was to keep hands clean when driving a car. Since first cars did not have a cabin, drivers were in the open, which meant they would get dirty from the splashing mud, rain and all other dirt that today’s drivers don’t worry about. Of course they were protecting the driver’s hands from the cold but also from the wooden veneers since first steering wheels were made out of wood. The use of driving gloves led to term “glove department” or “glove box” which we all know is small storage area in the dash or under the seat. In the early days the leather was thick, heavy type, and it did not allow any great sensitivity of feel. It was considered not to be so important as the steering mechanism would not have been very sensitive, and movement would have been rather crude requiring a strong grip of the wheel. Over the years manufacturers, realized that good grip is influential safety factor and they started to produce thinner gloves with better feel and non slip surface. This way of producing driving gloves started in the middle of the 20th century and continued onwards. Fashion also had a big role in the population of the driving gloves and they were extremely popular in the “swinging 60’s” when they became must have fashion accessory. As the cars and fashion evolved so did the use of the driving gloves. With the growing modernization of the cars in the 70’s and the 80’s, that became equipped with the standard heating feature and good non slip surface of the steering wheel use of driving gloves declined, but today, driving gloves enjoy something of a resurgence. If you ever driven your car in driving gloves than you know what a feeling it is. Modern driving gloves have better grip and they increase feel and control of the car. They just provide better feedback to the driver. Today you can find different styles on the market but best ones are made out of deer, lamb or peccary skin leather. They should fit tightly and have external seams. Some can even be fingerless while holes for the knuckles provide better flexibility. When buying your driving gloves always look for the hand sewn ones. Preferably from Peccary leather. Peccary is a South American wild pig. 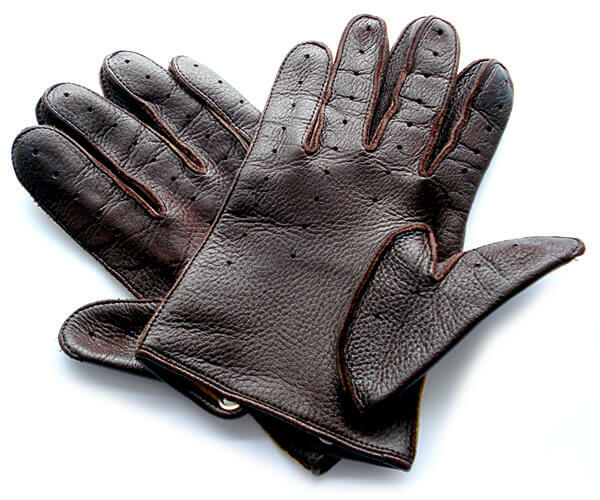 Peccary leather is the best leather for the gloves, rarest and most luxurious. This is why this type of gloves can be very expensive. The production is time consuming and difficult which requires skilful master to do the job. While browsing trough the internet in search for the perfect glove I stumbled upon this Finish brand called Sakari Sauso. When I saw it is Finish company I knew it must be something of a good quality. I believe in Scandinavian quality and dedication to produce great products. Sakari Sauso was founded in 1929. The founder of this company learned his skills from the German masters and soon they became one of the best handmade glove manufacturers in Europe. Their mission is to use only the best possible material for their products. These include hair from Ethiopian sheep, South American wild pig and Finish reindeer leather. The linings of their gloves are either of silk, wool or cashmere. Today Sakari Sauso is manufacturing the gloves in Hungary. You may think that they are shifting the production to eastern Europe because of a cheaper labour, but that is not the case. Hungary is the only remaining country in Europe where skilful leather cutters still exist and old skills and methods of old glove masters are still intact. Since the process of cutting leather is very slow and requires skill, cutters can cut only around 30 pair a day. Leather can have natural flaws and each pair has to be treated individually. Leather is stretched and measured in a special way to provide perfect fit. This kind of knowledge requires up to 4 years of training to learn the profession the right way. Each glove has at least 16 individual parts and some up to 20 so sewing is done carefully because the materials used are very smooth and demanding. Sewing is done in pique seam which is the most beautiful sewing method. These gloves are of elk leather. Palm side is in brown color and the dorsal side is in khaki color. Their style is typical drivers gloves style, with air holes and push button. Air holes are also on the palm side of the hand. The big hole bellow the push button just adds that cool factor to the product. Although these gloves don’t have the holes on the knuckles I think they are not necessary at all. Push button is really sturdy and some force is needed to close it down. So no way it will open by itself. To open it, it also requires some force. In think this is good characteristic since it proves the quality and durability of the product. Stitching is in pique seam which is perfect and is almost not visible. 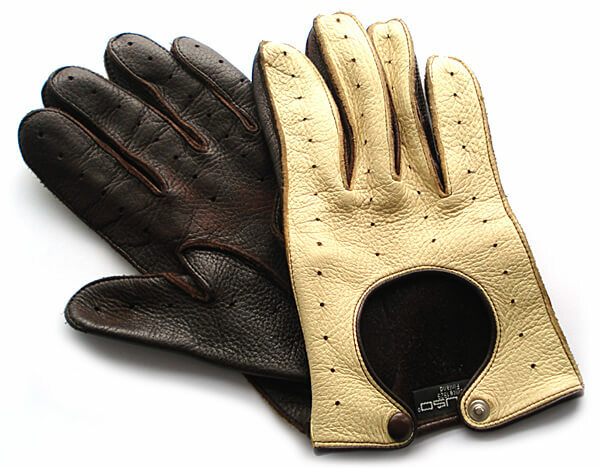 Since the gloves are of elk leather they are very soft, thin, elastic and very comfortable. They are in no way cumbersome and they feel snug to the hand. It almost feels like you don’t have them. Lining is a combination of wool and silk, thus keeping your hands warm but they wont keep you warm at around 0C temperatures (around 30F in US). Also I do not recommend to fiddle with the snow with them since it is not advisable to wet them. Besides driving glows are not intended for really cold weather and snow. Sauso’s gloves do not hinder the feeling of the control like some thicker gloves. They do not slide across the wheel like woollen gloves (I do not recommend to drive a car in woollen gloves) so there is no chance that you wont make that turn when needed. Driving with them is real joy, not to mention the super cool look that they provide. With your hand on a wheel they make a really powerful image. I can only recommend these gloves cause they do not have any flaws in my opinion. They look great, the quality is excellent and the price of around 100EUR ($130) is more than fair for such a great product. 5 Comments on "Driving Gloves – The Coolest Accessory & Review of Sauso Driving Gloves"
Unfortunately I cannot help you. It is stock image and no info was provided about the maker of the gloves! Does anyone know if you can buy these gloves in the US or if they will ship to the US? The grammar, spelling and syntaxe in this article are appalling! Bad grammar?!!!! Give us a break, we’re talking about gloves, not grammar! I thought this was a nice personal opinion which helps any potential buyer a lot. I wasn’t so sure I agreed with the opinion that a stiff fastener is an asset. Do I really want to have to ask my mates or my wife to remove my gloves?!! !